A film must understand the nature of its villain. The code it operates by, its physical abilities and limitations, its ultimate goals—all these factors determine the kind of force that our hero will square off against. If the director and screenwriters don't understand these basic principals (or at least make clear that they can't be understood), there's no hope for the audience. "Terminator Salvation" not only misunderstands its villain, it blatantly contradicts its own descriptions of it. Here is a film so confused about what it's doing that it gives its title twice during the opening credits. We're told one thing in expositional dialogue, but see another when the robotic bad guys come out to fight. The self-aware computer/machine Skynet (not to be confused with the relatively benign Sky Network in the UK) created robots called Terminators, but a more apropos name would have been "Throwerators." These super-strength robots were created for one task: killing humans. But whenever they get their hands on one, whose neck they could easily break, whose heart they could rip out, whose brain they could squash, whose spine they could snap, they merely throw them against something (usually a wall). And don't get me started on their aim when they actually decide to shoot their laser guns at people. There's a reason that the first two Terminator movies were primarily chases, and particularly tense ones: If the robot got close enough to its targets, it would kill them. Director McG missed that factor when he designed "Terminator: Salvation's" fight scenes, which are based on hand-to-hand combat against robots undeniably superior in strength. 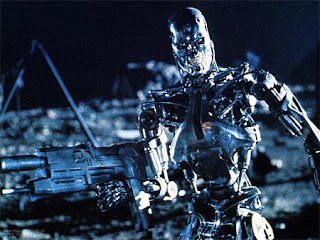 Even if the scenes were well-done (they more often tend toward mediocrity), it would be hard to shake the feeling that apocalyptic prophet John Connor should have died the first time a Terminator grabbed hold of him. Played by Christian Bale in this installment, Connor has lost all the piss and vinegar of the young lad portrayed by Edward Furlong in "Terminator 2: Judgement Day." He now acts resolutely somber and repeats the same three or four lines of character points without humor or energy. Sure, he's living in a desolate wasteland inhabited by robots who want him dead (incompetence notwithstanding), but come on mate, give us a smile. Sam Worthington as Marcus Wright proves that not everyone acts like such a mind-numbing spoilsport in the future. Marcus donated his body to science while on death row in 2003. Imagine his surprise when he wakes up in an empty, destroyed Los Angeles in 2018, looking the same age. Under seige, he meets teenager Kyle Reese (Anton Yelchin), the character played by Michael Biehn in the first "Terminator." From that film, we know little Kyle will grow up to travel through time to protect and impregnate Connor's mother, assuming the future and/or past don't change. Kyle teaches Marcus about the Skynet robots, and Marcus serves as a father figure to the lad. Oh yeah, I almost forgot: A randomly thrown-in mute girl named Star travels with them as well. Just when the Reese-Wright relationship starts to get interesting, the film abandons it to propel its nonsensical plot. McG continually loses sight of his film's greatest assets to focus on silliness like Skynet's Holocaust-esque human-transport machine. Skynet is wasting resources to move humans when its only known goal is to kill them. One would think that the resistance would at least investigate why the machines are going through all this trouble. Instead, the humans stand around bored, waiting for another robot attack so they can ineffectively smack the mechanical behemoths who want nothing more than to throw them against walls.